Newt Gingrich defended his critique of President Obama as the "greatest food stamp president" in history, dismissing the president's charge that Gingrich was tapping into "worst instincts" with the claim. In an exclusive interview last week with ABC's Diane Sawyer, Obama responded to Gingrich's regular campaign trail refrain on food stamps, with the president saying that "the American people are going to make a judgment about, you know, who's trying to bring the country together and who's dividing it, who is, you know, tapping into some of our worst instincts." Today on "This Week," Gingrich strongly dispute the charge, telling me that "for a president who runs around the country attacking people and who runs around the country being divisive to describe worst instincts is to describe a large part of his own presidency." 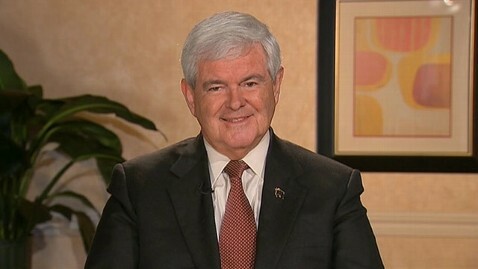 "I described something which is factually true," Gingrich added. "His failed economic policies have forced more Americans to apply for food stamps than any president in history." Gingrich said the "paychecks vs. food stamps" comparison he regularly makes will continue to be part of his campaign, despite the recent criticism that the charge has racial undertones. "I think he doesn't want to defend his record of killing jobs. He doesn't want to defend his record of putting people on food stamps," Gingrich said. "But paychecks vs. food stamps is a totally legitimate choice to offer the American people and one which I am determined to make a major part of the fall campaign.